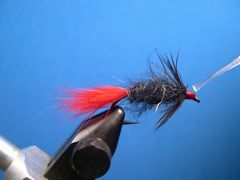 The Black Gnat is one of many modified trout wet flies that take a variety of panfish, especially Bluegills. Larry Dahlberg in his DVD, "Panfish and Bass," says that the Black Gnat takes panfish anyplace at anytime. He's right! Weight (optional) Lead Wire .015 Dia. 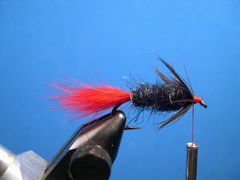 This little wet fly can be made with a variety of materials. The tail could be marabou instead of rabbit, the body could be black chenille instead of Hare-Tron Dubbing, and the collar could be any soft webby feather. I like to use a tuft of rabbit fur for the tail on wet flies because it provides a lot of movement in the water. 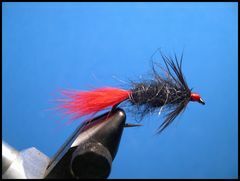 I like Hare-Tron Dubbin for wet fly bodies because it really looks buggy, especially after its brushed with a dubbing brush. 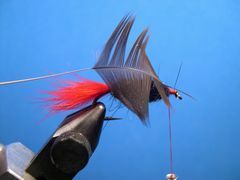 I tie the Black Gnat with weight on some and no weight on others. Without weight it sinks slowly and it's often taken by fish on the slow drop. The Materials List calls for a Mustad 3906B 1X long wet fly hook. If you don't have that hook, check the Hook Comparison Chart for a substitute. Fish the Black Gnat in and around structure and especially parallel to weed lines. If you loose a fly from time to time it's worth it. 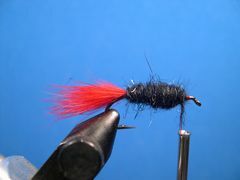 If the fly isn't taken on the drop, try different stripping sequences. Strip-pause-strip, strip-strip-strip, strip-strip-pause, etc. On of my favorite stripping sequences is two short strips followed by a long pause to let the fly sink to the bottom before it is stripped again. Often times the fly will be taken during the long pause. 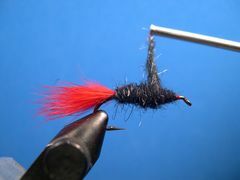 Clip a clump of rabbit fur from a Zonker Strip and tie it in at the rear of the hook. The tail should be about the length of the hook's shank. Build a tapered body with Uni-Yarn. Start the yarn at the front of the hook with a jam knot just like you did the tying thread and proceed to build the body. Note that the Uni-Yarn is in a material's bobbin for easy application. At this point you could skip the dubbing step, add the collar, and the fly would fish just fine. Uni-Yarn is great stuff. It makes great fly bodies. Tie off the Uni-Yarn at the base of the tail as shown. Remove the Uni-Yarn. Dub the body with a fairly thick noodle of dubbing. 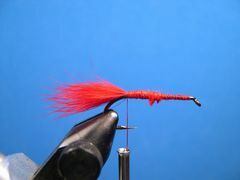 Be sure to leave room at the front of the fly for the hackle collar and a fairly large thread head. Prepare a hen neck or saddle feather for the collar as shown. 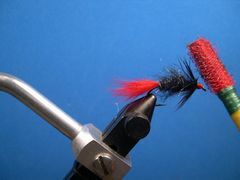 The feather's barbs should be long enough to almost reach the hook's point when the feather is tied in. 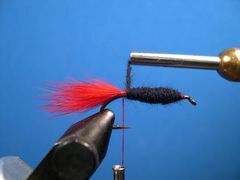 Tie in the feather for the collar by its tip with the cupped side of the feather facing the hook. 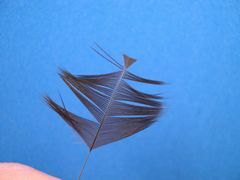 Wrap the feather two or three times to form the collar. Tie down the feather and remove any excess. 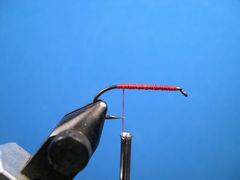 Form a fairly large thread head, tie off the thread with a couple half-hitches or a whip finish, and remove the thread. 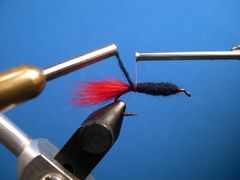 Lightly brush the collar and the body with a Dubbing Brush to make the fly look more buggy. If you don't have a dubbing brush and want to make one, click on Velcro Dubbing Brush. Coat the fly's thread head with head cement. I prefer Sally Hansen's Hard As Nails nail polish. 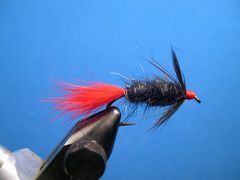 Your Black Gnat panfish fly is finished.